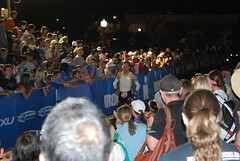 I recently gave my thoughts on the Ironman Boulder Ride Course and here are my thought on the run (click here for GPS data from SportTracks). A little bit about my running experience. I live a sea level and I would consider running my second best discipline in triathlon (swimming being number 1, so you can figure out where biking falls). It is rather hilly where I run so I rarely run on a flat course. For reference, I ran a 4:02 in Arizona last year; it was the run of my life! Not so sure I will do that again this year. You start at Boulder High School and run east (away from the mountains) on the creek path. The course splits off to the right and then back and off to the left to make a “Y”. There are many undulations as you run under many road overpasses. It is a two loop course. There is some dirt path next to the paved path you you might be able to vary the surface you run on. This will depend on how crowded the path gets I am guessing. I ran the course on my last training day in Boulder. It was day 4 at altitude after 3 previous days of training (the day before was a big one). My plan called for 2:45 of running so I was hoping to get in 17-18 miles of the course. I wanted to do one true lap and then just run some more for the time. The run started well but by mile 9 I started to fall apart. It could have been the heat, the altitude, or just the fatigue of the week. I was very humbled by the run. At least I got the bad run out of the way. Also, as you can see, I wen off course on my way to the leg by Foothills Blvd. The path is right next to the bridge that crosses over the road; I didn’t run far enough to find it. The important thing to note (in my opinion) is that once you turn back from the second out and back (when you run out to 55th) it is a long, and slightly deceiving, run up hill for 5 miles. I had run part of this the day before and I could really feel it running from 9th past the park at the top. Do not underestimate how this long slow climb will feel. Especially the second time you do it. But what goes up, must come down! It should make for a nice fast finish when you turn round for the final 3 miles. The path is a little bit narrow in some places so it might get congested as the day goes on. A little request, this is not meant to sound snobby, please try not to run 2 across. This will make it really hard for the people on their second loop that are passing those on their first. 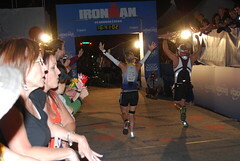 I found this to be a problem when I did Ironman Arizona (although I am not sure I will be having as good a run at this race). Also, because the run crosses under a lot of roads which are mostly all numbered you can use the numbers to help gear where you are on the course. 9th is the last street you cross under on your way to the top by the park and 55th is the low point and the furthest point out.